Since tattoos were made popular in the western world by sailors, pirate tattoos have always been a favorite motif for body art. Pirate tattoos have become even more popular since the release of the Pirates of the Caribbean movies. If you are thinking about getting a pirate tattoo, this article may help you figure out which pirate or what pirate symbol best expresses what your tattoo will say about you. There are many legendary fictional and real-life pirates, with some amazing stories surrounding their activities on the high seas. Here are a few of these notable outlaws. Captain Jack is perhaps the most well-known pirate to modern day pirate fans. Jack Sparrow never really existed, but was brought to life by actor Johnny Depp in the Disney movie Pirates of the Caribbean. This fictional pirate lives by his wits and would rather escape confrontation through clever negotiations than bloodshed. The image of Jack Sparrow is seen often in pirate tattoos. This famous pirate was feared by many during his life as a bandit on the high seas. His reputation has lived on, and he is an icon among historical "bad guys". He plundered many vessels from his ship "Queen Anne's Revenge". Blackbeard wore a sling with multiple pistols across his chest and kept many knives and a cutlass in his belt. He had an epic weakness for the ladies, and was said to have had 14 wives. Blackbeard died in battle on November 22, 1718. Captain Kidd was most famous for his buried treasure. It is said that this pirate buried his treasure somewhere in Long Island, New York before his execution. Captain Kidd did not begin his nautical career as a pirate, but was declared a pirate by England. He was eventually hanged for his crimes and upon his execution, the hanging rope broke and he had to be hung again. This pirate of Treasure Island fame would have had no luck at all if not for the bad luck that he could not seem to escape. Many pirate tattoos are not portraits of pirates, but have a pirate theme. 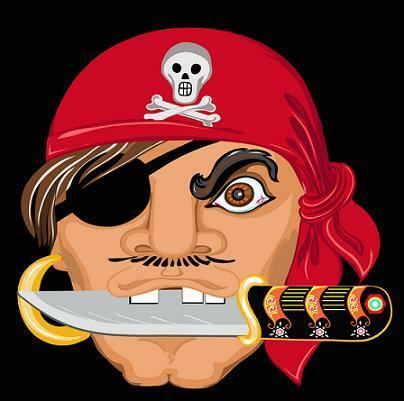 Piracy is rich in history and lore, and there are many symbols that would make an interesting pirate tattoo. Pirate Ships-Jack Sparrow's story begins with trying to regain his beloved ship "The Black Pearl". Pirate ships make beautiful art as they convey a sense of freedom and riding the wind. Treasure Maps- "X" marks the spot to find riches on a treasure map. These types of maps are synonymous with pirates and their stolen wealth. Pirate Flags- The skull and crossbones of the Jolly Roger flag is the universal symbol for pirates. Flying flags was the way pirates waged psychological warfare on their victims to try to encourage a quiet surrender and minimize fighting. Once you have selected the theme for your pirate tattoo, you may be wondering where it should go. You might consider placing a treasure map on your heart. Pirate ships make beautiful back pieces, while flags look great on shoulders and upper arms. Portrait pirate tattoos can go almost anywhere, though arms and shoulders seem to be a popular choice them. Talk to your artist about the best body placement for your pirate tattoo. Artists often have the best insights for what body location will best showcase your tattoo.